Setting goals and achieving them is something many of us strive to do every year. We may set a New Year’s Resolution and then map out a way to achieve it. For me, my New Year’s resolutions started last August. I can tell you that this is the first year I didn’t wait for the new year to start. I took a leap of faith in the middle of the summer and mapped out some goals I wanted to achieve in the new year. Guess what? It’s working! I realized that you need ramp up time! I needed four months to get through all of the beginning stages and truly create some new habits and also plan for some big goals ahead. So it’s January 30th and I can say I am hitting my New Year’s Resolutions out of the park. But the key was I didn’t start them on 1/1/19. I started them on 8/13/18! This is the first year I can tell you I am so encouraged by the momentum. And I feel invincible. I feel like there’s nothing I can’t do this year! And that feels amazing. I’ve already written a few times about my fitness goals. Healthy eating, good nutrition and my workouts are helping me feel amazing physically. Mind, body and spirit. My head is less foggy and my stomach doesn’t hurt. Do you know my stomach hurt every day? And now it doesn’t. It’s amazing what good fuel will do! One of my other stretch goals was to do some public speaking. It was hard for me to even put that down on paper because the idea terrified me. Talk about stepping out on the tightrope and knowing you could fall flat on your face! That’s never a feeling I like to have. I like to succeed and achieve and putting this one out there was way outside my comfort zone. I had to put a video submission together for Driving Sales and NADA. 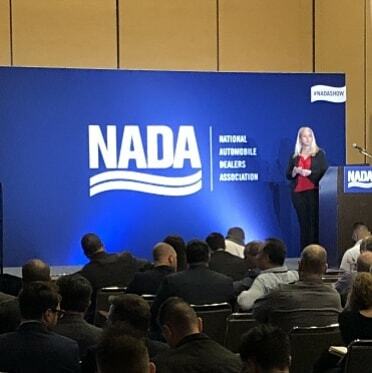 Two large national conferences in the automotive vertical. With the help of my amazing creative team and video team at work, we shot a video and submitted it for review at these two conferences. And, drum roll please, I got in! Wow, I was chosen for both! Whew, now I was really terrified! Now I had to do it! Now I had no choice! No one knows how nervous I was to get up there in October at Driving Sales and give my presentation. The panic inside was real, only no one could see it. Preparation is the only way to combat that feeling. So I wrote it, rewrote it and rehearsed it a million times. I also had great support from my team members. My boss, the CEO of Dealer Inspire sat in the front row and reassured me that he knew I could do it. And I did. It was amazing. The audience was engaged and had great questions. The Q&A section was longer than my presentation. And I was flying high. Then I did it again at NADA this past week with three times the audience and just as much engagement. It was such a rewarding experience and fulfilling to hit this goal out of the park. I also spoke at the Gary V. Agent 2021 conference in Miami, FL in January. I was chosen to be on a digital retailing panel with 4 other industry leaders. These were stretch goals of mine and I wanted to run away from them a million times. I tell you that, because I want you to know that things people achieve every day are not necessarily easy. Even if they look easy. There is internal struggle and doubt and fear. And if you push through all of that, then you’ve won. I feel great heading into February. New goals ahead of me. Continuing to strive and push myself. This is definitely the year I am going to push myself completely out of my comfort zone! I’ve always believed if you reach for it you can achieve it. And this year I am proving that to myself! Thanks for reading. And thanks to everyone who believed in me! It’s been an amazing experience. Nicolle Lamb, Senior Vice President of Client Services for Dealer Inspire, has more than 20 years of experience in marketing. She lives in the suburbs of Chicago with 3 amazing kids and a wonderful husband. Baseball, Fastpitch, and Volleyball schedules are just a few pieces of Nicolle’s Mom Hustle. Spring tests her sanity every year due to these sports schedules. She enjoys decorating, DIY projects, pretending to be a runner, reading, and spending time with her husband, 3 kids and her dog.